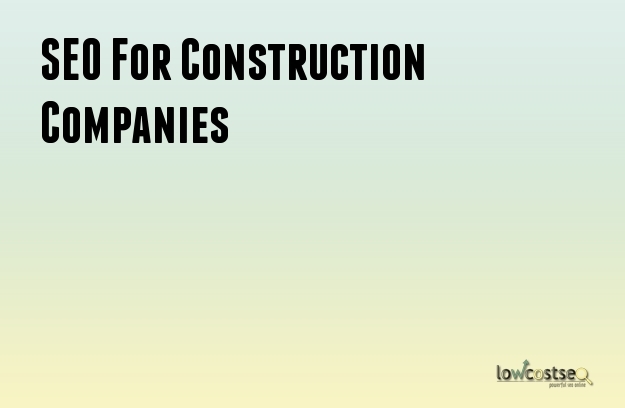 Construction companies often offer a lot of services in a very competitive market. As business moves online more and more, the need for relevant SEO becomes increasingly important. So, how can you tailor an SEO campaign for such a specialised firm? Let’s find out! The construction industry is one area where it is hard to give a direct quote. Each project is different, due to the size of the build, any extra work involved, the materials used and more. As such, any potential customers are likely looking for a contact option, especially when they are canvassing a number of different companies. As such, your phone number and e-mail address should be clearly displayed on your home page. It should be prominent enough that Google picks this up easily – if you’re a local-based business, this will help with Google map results. Construction companies often specialise in specific areas, so it is important that you target the keywords that are relevant to the services you provide. For instance, if you have expertise in public works, engineering or large scale projects, these are points that should be clearly established. Similarly, you also need to consider the geographical range of your potential audience. Are you based to one specific area, or are you a national firm, willing to the project site? There is a big difference between the two options and a thorough keyword analysis will be needed to ensure you are targeting the right areas. Someone looking to build an extension on their home, for instance, isn’t looking for a national company used to building towers and other large projects. Because construction companies are quite broad, it is recommended that you tailor your website to focus on the services and projects you specialise in. For example, if you often do smaller projects, such as home extensions, this is something that can be enhanced with content specifically on the subject. Try, for instance, offering a guide to the planning process for such a construction. This answers many questions that users have and will help drive traffic to you. It also helps to establish your company as an expert authority, which helps improve your branding. This can be done in numerous ways, such as through a blog or, if the content is rather in-depth, specific landing pages for each service. The latter is a great way to optimise your website, directing specific queries to the right area. A strong back-link profile is important for any website, but you have to ensure you link via worthy websites that have a high relevancy. While there are some good online directories, you need to do more than this. For instance, a larger firm may want to look at news outlets, specialist industrial websites and other areas that would be interested in the larger projects you work on. Case studies are a perfect example of the kind of content that could be used here. Smaller firms, on the other hand, can focus on local newspapers, listings and social media.